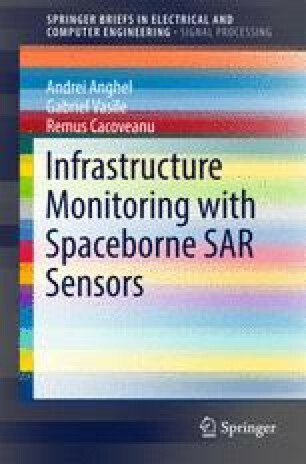 The chapter begins with an overview on SAR scattering centers’ detection and tracking in the context of infrastructure monitoring. Onwards, a SAR signal processing methodology for infrastructure monitoring, which exploits a digital elevation model or a point cloud of the envisaged structure is described. It is the main contribution of the book in the field of spaceborne SAR image processing. First, an azimuth defocusing method for SAR images is introduced. The defocusing gives access to the phase history and is compatible with various imaging modes (stripmap, spotlight, and sliding spotlight). Next, a back projection of the defocused signal on the available 3D model is presented, followed by a scattering centers detection method based on 4D (range-azimuth-elevation velocity) tomographic reconstruction. The performances and limitations of the developed processing chain are emphasized through extensive simulation results in the last part of the chapter.